From left, Insular Superintendent Dionne Wells Hedrington, Education Department Chief of Staff Anthony Thomas and Aecom Project Director Pat Mitchell meet reporters to discuss progress on installing modular classrooms across the territory. With most public school students enjoying summer vacation, Education officials showed off the preparation work now under way to put modular classrooms in place by fall. 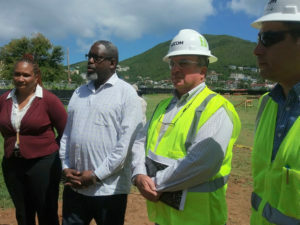 On Thursday officials led members of the news media on a tour of a St. Thomas school site where work is in progress to receive modular components a few weeks from now. “Our goal is to get children in school on the 28th of August,” said Pat Mitchell, project director of AECOM, the firm in charge of the modular school project. At Lockhart Elementary School, St. Thomas’ largest public school, subcontractors set up wooden horses along short trenches cut into the play yard. This is where the modular buildings will be set up, once they’re delivered to the site. Lockhart is one of 15 school sites slated for modular installation territory wide. About a dozen workers moved materials into place under an early summer sun, five weeks into a new Atlantic hurricane season. AECOM is a global engineering and construction firm, working on energy projects, water projects, urban planning and project management worldwide. A veteran of restoration projects staged in Afghanistan, Pakistan and Iraq, Mitchell said the V.I. modular school project was a first for him. As he surveyed the scene, the project director said he visited Lockhart prior to the start of work and saw the daily romp of students on the field at lunchtime. The project could have started sooner, he said, but letting students have some normalcy as the school year wound down was important. Mitchell said the biggest challenge facing contractors is logistics, getting materials produced in factories from Florida, Georgia and Pennsylvania to arrive on island at the same time. There was also coordination needed for delivery of a sprung structure being put together in Utah. Reinforcing steel used to tie everything together is sourced from Puerto Rico, a much shorter trip. That same process, will be repeated for school sites on St. Thomas, St. John and St. Croix, at an estimated cost of $117 million. 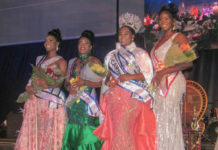 On hand, promising to keep an eye on the progress, was St. Thomas-St. John Insular Superintendent Dionne Wells-Hedrington. Hedrington said she and her team would tour modular school sites at Charlotte Amalie High School, Yvonne Bowsky Elementary School, Ivanna Eudora Kean High on St. Thomas and Julius E. Sprauve School and the former Guy Benjamin Elementary School on St. John. “I’m excited to be here because I’m seeing and I’m believing this is going to be a reality,” the superintendent said. 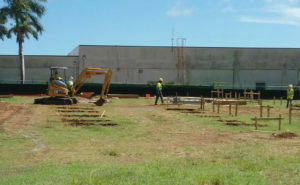 Workmen mark off space for installation of soon-to-arrive modular classrooms Thursday on campus at Lockhart Elementary School. She added that Education officials are mindful of concerns and protests staged by parents and students recently over the loss of recreational space on campuses for the placement of modulars. Although modulars for the displaced Addelita Cancryn Junior High School will occupy much of the space on CAHS field, and on the tennis court on the eastern end, the track will remain untouched, Hedrington said. Talks have taken place with UVI President David Hall over use of the UVI field for public school athletic programs. 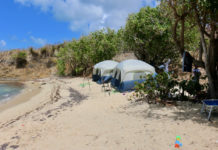 On St. John, school officials are reportedly in talks with officials at the National Park Service over use of the NPS baseball field near the Cruz Bay Visitor’s Center. And, she said, funds set aside for the installation of playground equipment at Sprauve School will move forward. But making sure students return to full days of classroom instruction when the new school year begins remains the superintendent’s priority. “Students deserve to attend a full day of school,” Hedrington said.